The Week in iPad Cases: G'day, mate! Another week, another installment of our ever-popular iPad-case roundups. 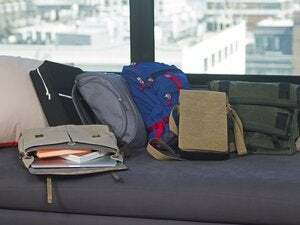 This week's selection includes some interesting contenders, from the exotic allure of kangaroo leather to the iPad generation's answer for the eighties boombox. Aranez: All the way from Down Under comes Aranez’s selection of kangaroo-leather cases (iPad 2; price unavailable), each made from authentic Australian-kangaroo leather. A boon for lovers of the exotic, the company says its leather is a byproduct of a culling campaign conducted by the government to control the kangaroo population, rather than from kangaroos raised specifically for tanning. Element5: The Swiss-made Mini L (iPad 2; approximately $425 at current exchange rates) sports typical Helvetic ingenuity in the form of a carrying bag combined with a large solar panel that gives your iPad's battery half of a full charge in about three hours as you travel around. The case can also recharge your iPhone or iPod touch—for those, two hours of sunlight gives you a full charge. G-Form: The Extreme Portfolio (iPad and iPad 2; $80) fleshes out G-Form’s line of extreme protection with an iPad portfolio that can also be used as a viewing stand thanks to its reversible zipper. Given the amount of protection it provides—check out the company's YouTube videos—I’d bet it’s sturdy enough to withstand just about anything you can throw at it—or you can throw it at. iBaggs: The Traveler (iPad 1 and iPad 2; $55) features sturdy, military-grade materials in a case that features a shoulder strap, a pop-out stand for landscape viewing, a handstrap, and an accessory pocket. A “Plus” model (iPad 1 and iPad 2; $60) also includes a clear optical cover to protect the iPad’s screen while it’s in the case. Each model is are available in nine different styles, including leopard skin. iLuv: Perhaps, like me, you're old enough to remember boomboxes—the pinnacle of music portability in the '80s. Bulky, and with poor battery life to boot, they made it possible for teenagers the world over to enjoy music at the beach, when camping, and in a million other places without a power outlet. Fast forward twenty years (or so), and iLuv aims to provide the twenty-first-century equivalent: the iSP210 (iPad; $60), a case that includes a set of powered speakers for your favorite tablet. Available in black, pink, or blue, the iSP210 requires four AA batteries and plugs into the iPad’s headphone jack. InCase: The company’s popular Snap Case (iPad 1 and iPad 2; $35) is now available for the iPad 2, too. The Snap is a thin, transparent case designed to attach to the back of Apple’s tablet and provide protection without obscuring the iPad's beautiful design. A strategically-placed cutout along the left-hand edge ensures compatibility with the Smart Cover. Sena: The Kutu (iPad 2; $70) has a funny name, but it's all business. This slim sleeve, made of genuine leather, includes a ribbon-release pull strap for easy removal of your iPad and is compatible with Apple’s Smart Cover. The sleeve ships in a special keepsake box and is available in black, orange, red, or purple. STM: The Kicker (iPad 2; price unavailable) is a slim folio-style case with two stand settings—one for typing, the other for viewing—using a kickstand made of a textured leather-like material. Designed for maximum protection, the Kicker is nevertheless lightweight and adds minimimal bulk. It features all the appropriate openings for easy access to the iPad’s cameras, buttons, and ports. It comes in black, burgundy, or olive. Vintcase: “Not Made in China” is the motto of this company, which manufactures all its cases in the tiny Spanish village of Ubrique. The Original Vintcase (iPad 2; €79) is made entirely of leather and designed specifically to fit the newest addition to Apple’s tablet lineup. The Vintcase can function as a viewing stand or a typing platform, and it comes with a handy strap with which you can securely close the case.